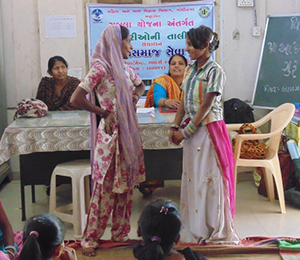 BSST implemented the SABLA training program on Nutritional Health, Entitlements and Decision Making Skills for the Adolescent Girls (AGs) across 120 villages in Kankrej and Danta taluka of Banaskantha districts with the UNICEF team and ANaRDe team. 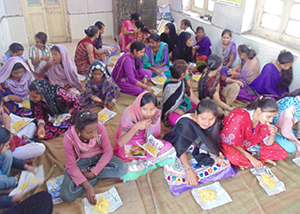 On finalizing the strategy for implementation of the training program ANaRDe Foundation was working on the formation of the Kishori Samoohs whereas the UNICEF team supported BSST team in finalizing the schedule, content and the main trainers for the training program. A specialized and experienced trainer from the field of Nutrition, Health and Life Skill Development was finalized for imparting training to the Master Trainers. A rigorous 3 days training of Master Trainers was organized that helped them to understand the concept of Importance of Nutrition among AGs, Decision Making Skills and various Government Entitlements. The training program and its content were designed in a simple manner with more exercises and illustrations for them to understand the concept easier and quicker. Moreover, the content was developed also considering that the trainers can answer to the queries raised by the AGs or any other participants at the village level training program. There was more usage of Pictorial Presentations, Learning Games and Videos etc in the ToT. After the successful completion of the ToT for the Master Trainers, the villages shortlisted by ANaRDe Foundation were divided among the group of two trainers. The pairing of trainers was conducted in such a manner that each one has grasp on one topic of the training. The schedule of the training program at the village level was spread across three months of time period to be conducted on every weekend (Saturday & Sunday). The participants of the training program were provided with a Training module which included the topics to be covered along with the details of the sessions to be conducted. 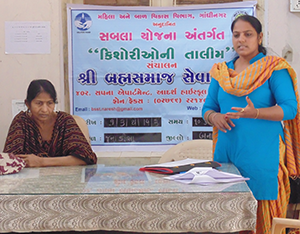 Below are the details of the trainings conducted in two blocks of Banaskantha district under SABLA Program for the Adolescent Girls of the villages. After three weeks of the completion of the program a quick post training assessment was conducted by our team members by visiting the villages Solsanda, Pataliya, Ganchhera, Nagal, Bhavangadh and Vasi in Danta Taluka and Kuvarva, Isarva, Zalmor, Changa, Raner & Khimana in Kankrej Taluka to meet the training participants as well as the other peer members who were briefed by the AGs about the learning’s in the training program. The villages selected were based on the population and the geographical location and the involvement of the AWW’s so as to cover maximum areas of both the blocks.